The 5/8λ vertical is quite popular, being ascribed some magic pattern properties. Objectively, a change in the pattern distribution occurs for a vertical monopole as its length increases past about 60% of a wavelength. Installed over an excellent ground system, it offers a small amount of gain in a major lobe at quite low elevation. Whilst it might offer a good pattern, it does not have a feed point impedance that is at all suited to direct connection to a 50Ω feed line. Fig 1 shows the feed point impedance of a vertical monopole over a perfect ground plane from an NEC model. The models were created with a 10m high conductor, 50mm in diameter, and at frequencies from 13 to 22MHz. Note that the radiator exhibits a parallel resonance at λ/2 and a series resonance at 3λ/4. In between, it exhibits a resistance and capacitive reactance quite dependent on length. Importantly to the design of a matching network, the R component in the region of 0.6λ is significantly greater than 50Ω. This shapes the likely impedance matching solutions. 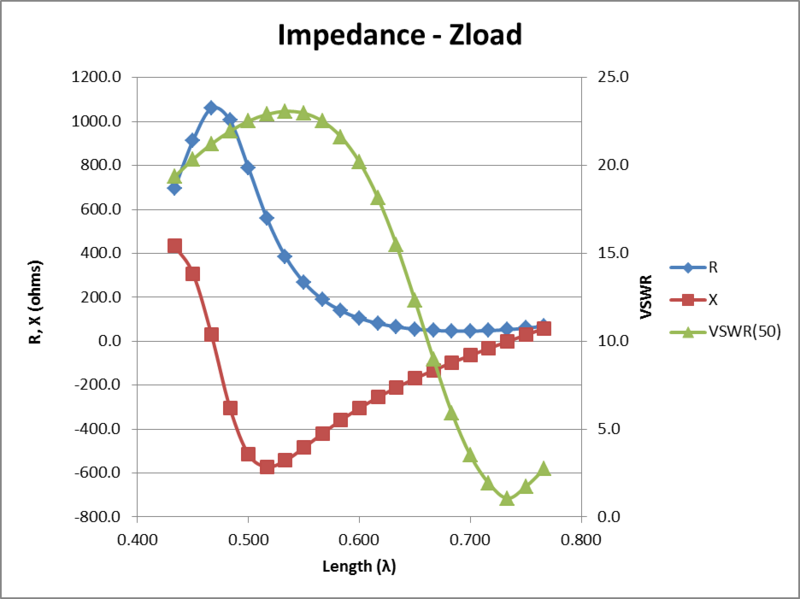 The following discussion is around an example feed point impedance of 100-j300Ω, but that will vary with implementation environment and hence the solutions are only a guide and must be tailored for the actual implementation. The simplest solution for many applications is a low pass L network with the shunt C on the load side. The strategy is to add sufficient shunt C at the feed point so that the series R of the combination is just less than 50Ω, then a series L to tune out the residual reactance. For example, if at 14MHz, the impedance at the feed point was say 100-j300Ω, a shunt capacitance of about 16pF will change the impedance to about 49-j215Ω. A series inductor of about 2.4µH will cancel that reactance, and its small loss resistance will raise total R to about 50Ω. In practice, both L and C would be adjusted for a perfect match at some preferred frequency. This solution is often proposed in ham discussions, but apparently with little understanding of how it works. Perhaps the popularity derives from its promotion in various ARRL publications. Fig 2 shows a diagram from (Straw 2007) illustrating a project for a 5/8 vertical for the 2m band. The tapped inductor can be translated to an equivalent network of three uncoupled reactances, and some stray capacitance represented by a shunt capacitance from the base of the vertical to ground. 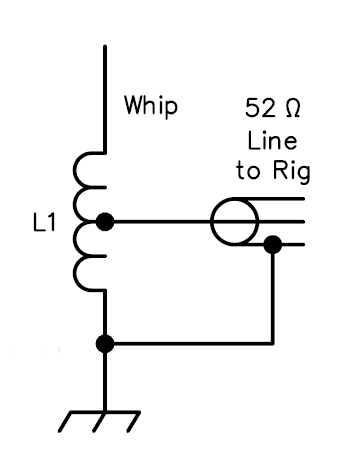 This network usually depends on the stray capacitance for its operation, it is not practical to transform the feed point impedance with R component greater than 50Ω using just two coupled inductors (the overall turns and tap point both must be adjustable, and the optimum point can be quite critical, and for some coil proportions, there may not be a solution). The design of the project base insulator results in a higher stray capacitance than that due to the coil alone. An equivalent stray capacitance of just a little over 1pF is sufficient to bring the R component to less than 50Ω. At that point, a simple series inductor could be used to tune out the residual reactance, but they have chosen a more complicated tapped inductor. If one studies the tapped inductor, it is tapped quite high, and the inductance of the lower section is so high that it doesn't have much bearing on the match, the effect of adjusting the tap is principally from the change in the inductance of the top section of the coil. Fig 3 shows the base assembly from the project. The projection of the vertical into the top turns of the coil, and the routing of the top turn through the insulator and near to the vertical helps to increase stray capacitance, and the very high coil tap can be seen. None of this is to question whether it works, but to offer an explanation of why it works. Let us assume that the coil in Fig 3 is 25mm diameter, 5mm pitch, 10.5 turns tapped at 7 turns, and that the feedpoint load is 100-j300Ω at 146MHz. We can calculate a three component equivalent for the coil, and plug that into a model of the system. Fig 4 shows the model where the coil is represented by the three inductors, and the load by the 100Ω in series with 3.63pF. (The negative inductance at the input is not a mistake, it is a result of coupling of the upper and lower half of the coil and the sign of mutual reactance is negative.) The 1.1pF capacitor is added to obtain a perfect match, without it, the VSWR is 2.5. This antenna system depends on some stray capacitance of the coil and antenna mount for its operation. In fact, replacing the tapped coil with a series inductor of 240nH and shunt capacitance at the feed point of 1.5pF provides a match with a simpler, lower loss circuit. Taking the example load of 100-j300Ω (100Ω in series with 38pF) at 14MHz, it can be matched with a solenoid coil of 15.3t, 40mm diameter. 2mm pitch and tapped at 6.3t. Fig 5 shows a model of the tapped inductor expanded into an equivalent three uncoupled reactances. (The negative inductance at the input is not a mistake, it is a result of coupling of the upper and lower half of the coil and the sign of mutual reactance is negative.) This element is key to obtaining a match. If the coil is reduced in diameter to 20mm (retaining 2mm pitch), there is no combination of turns and tap that will match unless the load is shunted with a small capacitance (12pF). So, if you must try this method of matching, a short fat coil is more likely to match than a long narrow coil due to the different mutual inductance between the coil parts. It is worth noting that the load impedance in this case is equivalent to 1000Ω in parallel with some capacitance. Some would claim that the capacitive reactance is 'tuned out' by the coil, and that the tapping point for 50Ω match should be (50/1000)^0.5=22% when the solution is actually tapped at 41%. The oft cited formula assumes that there is no flux leakage, which is often grossly wrong. Notwithstanding this, views such as [s]eems to me, if the inductive reactance of the coil equals the capacitive reactance of the antenna, then any tap point on the coil will be purely resistive and somewhere it will equal 50 ohms (W5DXP) prevail, it is an explanation often offered by those who don't understand coupled coils and mutual inductance. The scheme does not scale well to lower frequencies, a coil with higher inductance will typically be a larger diameter, and have less stray capacitance, and even less capacitive reactance. For example, it is unlikely that a 5/8λ vertical will match up on the 20m band for long narrow coils without some additional capacitance across the feed point for some coil proportions. It may only require 10 to 20pF of shunt capacitance (depending on the R component of a real vertical) to allow a match. There is no need for a tapped inductor (either for 2m or 20m), an adjustable series inductor in concert with an adjustable shunt C will allow a perfect match the frequency of choice. Some types of heavy duty mounts for HF verticals (eg for a 20m 5/8λ) may have more than sufficient built in stray capacitance to get the R component of feed point impedance below 50 ohms, and a tapped inductor may be quite practical. A variation on the L match is to connect a short length of coax to the feed point, and then insert a series inductor between that line section and the main feed line. 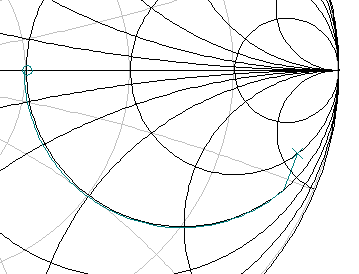 Fig 6 shows the solution on a Smith chart. X marks the feed point impedance, a line section of about 4° at constant VSWR intersects the R'=1 circle, then sufficient series inductance to follow around the R'=1 line to deliver an input impedance of Z'=1+j0, or Z=50+j0Ω. In practice, the series section would be adjusted so that Zin≈50+jX (X will be negative, and R needs to be a little less than 50 to allow for coil loss). The coil would then be inserted and adjusted for X=0Ω, and R should equal 50Ω. A single stub match is another option. A series line section is used to transform the feed point impedance to approximately 50//jX (Y=0.02+jB), and a shunt s/c stub is used to tune out the X component. Fig 7 shows the solution to transform a feed point impedance of 100-j300Ω at 14MHz to 50+j0Ω. If this were implemented with RG213 the series section would be 2.67m in length, and the stub 0.538m in length. The disadvantage in this instance is that there is considerable loss in the series section, around 0.6dB or 11%, and the total loss of the matching scheme is around 15%. A variant is to use a small inductor in place of the s/c stub with reactance of about 12Ω. Whilst that would improve the efficiency a little, since most of the loss is in the series section, the system will still have poor efficiency. In practice, the series section would be adjusted (without the shunt stub) so that Yin≈0.02+jB (in fact G needs to be a little less than 0.02 to allow for the stub loss). Many popular antenna analysers lack the facility to directly display admittance, so the displayed impedance must be converted to admittance at each measurement to find the appropriate length. The stub can then be connected and length adjusted for minimum VSWR. The matching methods discussed here are applicable to an antenna where the feed point impedance R component is greater than 50Ω, possibly much greater, with or without a substantial X component. An example is the Ringo Ranger antenna, an end fed half wave. The raw half wave is likely to have R somewhere around 1000Ω at resonance, and X from +500 to -500 either side of resonance. 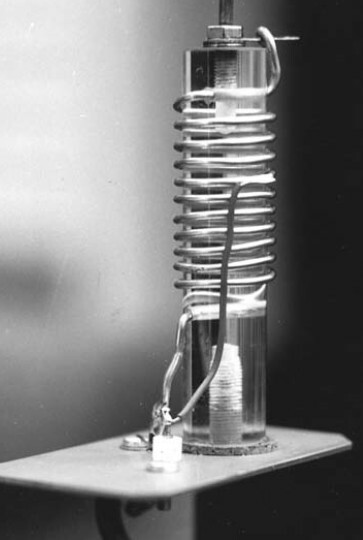 Most antennas of this type incorporate some equivalent capacitance in the base insulator construction , and possibly some further transmission line transformation in the connection to the tapped inductor. Straw, Dean ed. 2007. The ARRL Antenna Book. 21st ed. Newington: ARRL. 16.27-16.29.